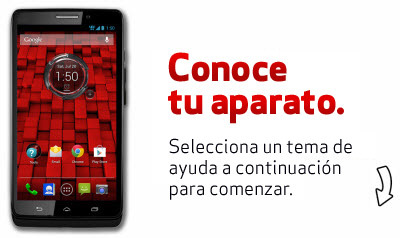 Encuentra asistencia y herramientas específicas para tu DROID MAXX de MOTOROLA en Internet. To wirelessly transfer data from your DROID Mini / Ultra / Maxx to another NFC-capable device, view this info. To make your DROID Mini / Ultra / Maxx visible to Bluetooth devices, view this info. Aprende cómo compartir fotos con Bluetooth en tu Droid Maxx de Motorola. Encuentra información sobre los servicios que ofrece Verizon Wireless en Alaska, incluyendo planes, equipos disponibles y próximas optimizaciones. Here's how to send unwanted calls directly to voicemail for your Mini/Ultra/Maxx. To view or clear the call history on your DROID Mini / DROID Ultra / DROID Maxx, check out this info. Aprende a compartir videos usando tu Droid Maxx de Motorola. Here's info on common camera settings (e.g., flash, timer, etc.) for your DROID Mini / Ultra / Maxx. Una guía visual para compartir la información de un contacto con otro contacto en tu Droid Maxx de Motorola. To turn the mobile data for your DROID Mini / DROID Ultra / DROID Maxx by Motorola on or off, follow these steps. To modify data usage options for the personal email account on your DROID Mini/Ultra /Maxx view this. If your DROID Mini / Ultra / Maxx shows the incorrect date and/or time, view this info to correct it. If the display on your DROID Mini / DROID Ultra / DROID Maxx doesn't rotate, this shows how to fix it. Una guía interactiva para configurar tu Droid Maxx de Motorola en modo avión. Here's how to update the personal email password and server settings for your DROID Mini / Ultra / Maxx. If you're not getting notifications for the personal email on your DROID Mini / Ultra / Maxx, view this info. Removing then re-adding a Gmail account on your DROID Mini / Ultra / Maxx often fixes email issues. Here's info on personal email settings (e.g., account name, etc.) for your DROID Mini / Ultra / Maxx. To adjust the personal email sync frequency settings on your DROID Mini / Ultra / Maxx, view this info. Here's how to add a work email account on your DROID Mini / Ultra / Maxx. To enter or edit the personal email signature on your DROID Mini / Ultra / Maxx, view this info. Here's info on updating work email settings for your DROID Mini / DROID Ultra / DROID Maxx. Aprende cómo reenviar un email usando tu Droid Maxx de Motorola. Aprende cómo cambiar entre ventanas en el navegador de internet de tu Droid Maxx de Motorola. Removing then re-adding a work email account on your DROID Mini / Ultra / Maxx often fixes email issues. Removing then re-adding an email account on your DROID Mini / Ultra / Maxx often fixes email issues. Here's how to view email messages on your DROID Mini / DROID Ultra / DROID Maxx. To turn Mobile Hotspot on/off on your DROID Mini / Ultra / Maxx or if you can't connect to Wi-Fi, see this. For issues connecting to the Mobile Hotspot on your DROID Mini / Ultra / Maxx, view this. Una guía interactiva para cambiar la configuración de seguridad del hotspot móvil en tu Droid Maxx de Motorola para poder elegir quién usa tu conexión a internet. To change the Mobile Hotspot password on your DROID Mini / DROID Ultra / DROID Maxx, view this info. To disable the screen lock setting on your DROID Mini / Ultra / Maxx, view this. Here's how to set up a screen lock (PIN, password, pattern, etc.) for your DROID Mini / Ultra / Maxx. Here's how to set up facial recognition to unlock your DROID Mini / Ultra / Maxx. Aprende a personalizar notificaciones activas en tu Droid Maxx de Motorola. To utilize the speakerphone functionality on your DROID Mini / Ultra / Maxx, view this info. To receive delivery confirmation for messages sent from your DROID Mini / DROID Ultra / DROID Maxx by Motorola, view this. To add, remove or edit the text message signature on your DROID Mini / Ultra / Maxx, view this info. Descubre cómo adjuntar un video a un mensaje de texto usando tu Droid Maxx de Motorola. Here's how to change permissions to allow or block sending premium texts from your DROID Mini, Ultra or Maxx. Here's how to share your screen with another display (TV, etc.) using your DROID Mini / Ultra / Maxx. To change the TTY settings on your DROID Mini / DROID Ultra / DROID Maxx, view this. Here's how to use Wi-Fi Direct so you can easily connect your DROID MINI / ULTRA / MAXX with other Wi-Fi capable devices. To remove a saved Wi-Fi network from your DROID Mini / DROID Ultra / DROID Maxx, view this info. View this info if the Wi-Fi network you want to add to your DROID Mini / Ultra / Maxx doesn't display.